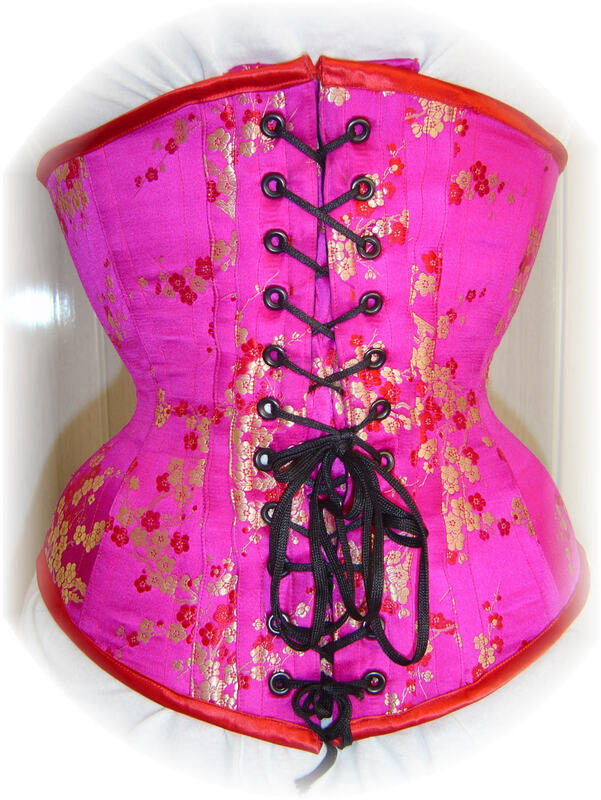 So How Do Men Differ from Women as Corset Clients and Students? Whether you are a ‘manly-man’ or a transgendered MTF, there are a few special concerns related to your body size and musculature that affect the corset you might order. It’s undeniable that compared to genetic women, men generally have more and stronger musculature than women, a shorter distance between the bottom floating rib (or ribs) and the pelvic bone, broader torsos and shoulders, and longer torsos. As for the corset itself, sending in the widest rib cage measurement and not just the rib measurement under the chest (or where a woman’s underwire would rest) might be wise to fully inform your corsetiere. Also, decide where you wish to place your waistline depending on whether you want a female or male torso presentation when corseted. The woman’s waist is normally above her belly button, the male waist below. Anchor your vertical meausurements by placing a string around the waistline you desire to create with your corset which may or may not be the same as your narrowest part of your torso, and may or may not be where you normally wear your skirt or pants band. Regarding vertical height, I’ve seen other corset sites recommend to men only a short cincher-style corset, that is, with a 9-10″ high front busk length. However, realize that if you don’t order the corset tall enough to rise to just under your chest swell, as you lace down, your upper ribs and flesh might or will push outward and become even more pronounced. That might be well and good for the ‘manly man’ desiring to create more of a Superman shape, but a real tragedy for the MTF who needs a narrowed torso to help create a more authentic female silhouette as well as better fit of female clothing. Recently I saw the point made that men have less fat and flesh over the pelvic bone than do women, and thus, a corset made too tight on the bottom perimeter might lead to leg numbness and discomfort as the corset laces down. However, this is true for slim people in general, no matter the gender. This will not be a problem if the corset is properly measured and constructed to accommodate the precise dimensions of an accurate pelvic bone measurement. The operative word here is “accurate.” Jpg images as we request of our long distance clients, always help your expert corsetiere to verify that you have measured wisely and correctly as to that matter. Can men train more or less effectively than women? What do you think? I have a few pointers on that question based on my years observing my clients and my students in my waist training coaching program, both men, women, transsexual MTFs and crossdress MTF, of all ages and backgrounds. Men can be, and are traditionally thought to be, more linear and goal oriented than women, and so setting goals and pursuing them to conclusion might be something that will fall right into a natural process for men. However, waist training is an endurance sport. It’s the marathon, not the 100 meter dash. Therefore, in many ways women are particularly equipped to waist train while men might tend to want to rush the process to reach their goal fast. Waist training is not about fast. It’s not about winning. Most likely Michael Phelps would not be very comfortable trying this type of corset “sport.” Waist training is about patiently enduring and focusing on the smallest of bodily signals, and gradually making progress. Men aren’t that great at focusing on, much less admitting, bodily signals, especially those of discomfort or pain that indicate they should back off a particular practice. Yet tuning in to the body’s every message is precisely what is required for effective–and enjoyable–waist training. But women sometimes can go on and on about the most minor of matters, and turn into something of a complainer — and that won’t work either! For waist training, an ordinary amount of careful attention to the body is advisable, neither ignoring tweaks nor exaggerating them. Sometimes women in training need to just learn to bear up, grit their teeth, and carry on, but if they have borne children, then for obvious reasons moms above others may have the best shot at waist training success. So can men or women waist train more effectively? I can’t say! We can surely educate ourselves as to what is required for any given sport or endeavor, and seek to make up for our deficits in order to accomplish our goals in that particular endeavor. Based on my experience, success in waist training is more a matter of keen motivation, setting waist training as one of one or two top life priorities for the training period, and being willing to take on a dedicated role as student rather than the eotist’s role as expert or teacher, that leads to the most sure success in waist training. Of course, a qualified, caring, and health-oriented coach can’t hurt! WELCOME TO MY VERY FIRST BLOG, AND BLOG POST! As the proprietress of ROMANTASY, I’m happy through the recent encouragement and assistance of my many corset-enthusiast business advisers and friends, to be posting my very first comment on my brand new blog launched January 9, just a few days past my 18th year anniversary in business! Please note that this blog is limited to discussions about health-first waist-training. I hope to answer your questions and learn about your experiences and advice for the many of us who adore top notch corsets!